Kiwi songstress Lorde has apologised for her "really insensitive" remark reportedly made about her friendship with pop star Taylor Swift. In a recent interview with The Guardian, Lorde was reported as comparing being friends with Swift like being friends with someone who has an autoimmune disease. "It's like having a friend with very specific allergies. There are certain places you can't go together. Certain things you can't do. There are these different sets of considerations within the friendship. It's like having a friend with an autoimmune disease.'" Fans took to Twitter to point out the insensitivity to people who actually do suffer from autoimmune diseases with one saying: "I wonder how Selena Gomez feels about this. What an incredibly ignorant analogy" - referencing Gomez's public struggle with Lupus. 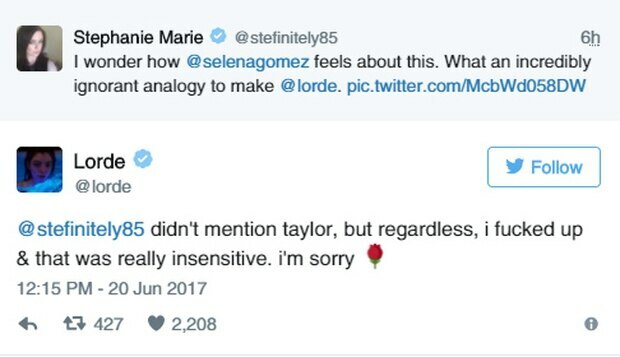 Lorde was quick to acknowledge her mistake and made no excuses, taking to Twitter to respond simply with: "I f***ed up and that was really insensitive. I'm sorry." Most fans were quick to jump to the Kiwi star's defence saying it was just a metaphor and Lorde didn't mean anything by it. One said: "I have an autoimmune disease and trust me, it is not fun, but I'm really glad she apologised. It's evident she didn't have bad intentions." And another added: "Nothing wrong with [what] Lorde said, and that's coming from someone with 10+ years of severe fistulizing Crohn's Disease."